Yesterday was the day I said good bye to summer and hello to a new season! It was the perfect way to spend a Sunday! After the illustrator did yard work, it began to rain (which was perfect and much needed). All four of us got in the action of scrubbing the house from top to bottom. After all the action the last couple of weeks brought, we needed to start to a new season in our lives. I love the rain during the day when you have nowhere to go. It makes the perfect opportunity to get into the kitchen and make some good ol' comfort food. 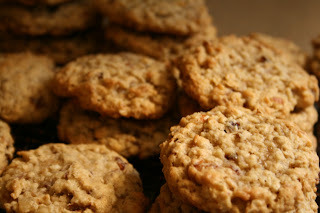 So, guess what goes well with a clean house and a relaxing afternoon...trail mix cookies, of course. These are a family favorite and thanks to Celine from Have Cake Will Travel, I now know that you can bake with Earth Balance from the tub! For the past couple of years I have been hesitant to make cookies for myself because I don't like to use shortening when I bake and butter is evil to me. I always had trouble substituting other things in place of the butter. So, I can now say that this works and I will definitely be using it in my baking from now on! Not to mention it is better for you than butter. How can you beat that? Now for the recipe...I got this recipe from Martha Stewart's Everyday Food Magazine. I love great base recipes that you can change around with whatever you have on hand. We love her recipe, but for this round I used a cinnamon raisin trail mix (I pulsed this in the food processor so the pieces were not so big) instead of the coconut and raisins. I also used the Earth Balance instead of the butter. I am now so ready for fall! your cookies look so tasty! I hate shortening too. can't digest the stuff, ugh! Thanks, Celine...they definitely are! Thanks for the baking help! I am sending virtual cookies your way!